Add the ultimate music composing secret weapons to your Sibelius workflow. 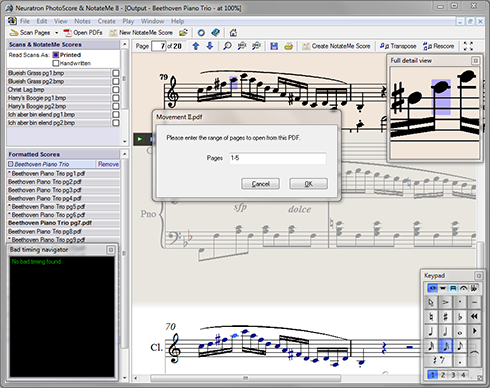 With the PhotoScore & NotateMe Ultimate 8 and AudioScore Ultimate 8 bundle, you can quickly and easily transpose, edit, and rearrange songs originating from sheet music, handwritten scores, PDFs, JPEGs, and audio files. This handy music recognition software can read printed sheet music, handwritten notation, and notation in JPEGs and PDFs in seconds—with over 99.5% accuracy. With this music-transcribing tool, you can quickly turn a CD track, MP3, MIDI file, or even your voice into detailed digital notation. Take a look at the advantages of PhotoScore Ultimate over PhotoScore Lite.